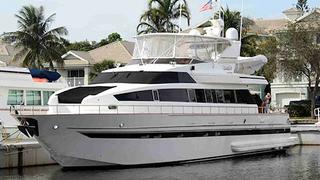 News from 26 North Yachts, who are offering motor yacht The Rock for sale from their Fort Lauderdale offices. This 87ft (26.5m) Hershine yacht was built in Taiwan in 1996, and was one of the first Hershines to benefit from improved production and quality-control systems installed by the yard. She boasts four cabins accommodating eight guests, and crew quarters for two. Carrying twin Caterpillar 3412 engines, she cruises at a comfortable 16 knots and has a top speed of 21 knots. New teak decks and new stabilisers were added in 2011.